For our final project in Public Relations Writing (PRCA 3330) we were asked to write a detailed blog post explaining what a social media news release (SMNR) is. Hopefully below I have thoroughly defined the SMNR, given some examples of how to format one, and given tips on how to write one. 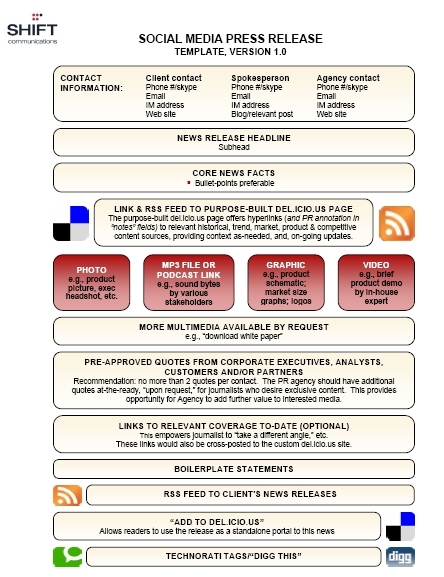 What is a Social Media News Release (SMNR)? What are the advantages & disadvantages of a SMNR? Some of the advantages include gaining access to visibility across the social web. If you include video links and links to del.icio.us you are putting the news across many different forums. You are increasing the changes and likelihood that your news will be seen and talked about. Videos on YouTube are viewed and downloaded constantly during the day and many people may view something on a social bookmarking site that they would not have seen otherwise. You are increasing the odds of getting your news and information heard and talked about (source). When should a PR practitioner consider using a SMNR? Include a link to images, and the best way to do so is to use a social media photo sharing services such as flickr or zooomr. The best part about social media is the ability to not only share your photos with bloggers and reporters, but with the right tags, the pictures can make their way onto the desktops of anyone searching for similar products/services for consumption and sharing. For example, if you go the link below, you will see a set of images that I created for the purpose of sharing artwork with PR/marketing writers interested in the launch of the Social Media Club. I’ve also tagged each photo with several different tags, including “socialmediaclub” and “social media” so that others can find these images when they’re searching for photos related to the subjects. Example: IX. Technorati Tags: Technorati tracks the number of links and the perceived relevance of blogs, as well as the real-time nature of blogging. What’s important for you to know about Technorati allows users to search by “tags” or keywords to help you identify who’s talking about your areas of interest. With Social Media Press Releases, readers will now also have access to your news – if tagged and published correctly. For example, this “how to” will carry many keywords, tags, and links, with “PR” and “SMPR” among them. Behind the words, the following tag will be hyperlinked, http://technorati.com/tag/PR and http://technorati.com/tag/smpr and updated at Technorati. So for example, if someone searches “PR” as a tag or as a keyword, this article will hopefully appear in the list. Remember to use best practices and publish only relevant and necessary tags – do not promote tag spam. Technorati tracks the number of links and the perceived relevance of blogs, as well as the real-time nature of blogging. What’s important for you to know about Technorati allows users to search by “tags” or keywords to help you identify who’s talking about your areas of interest. With Social Media Press Releases, readers will now also have access to your news – if tagged and published correctly. For example, this “how to” will carry many keywords, tags, and links, with “PR” and “SMPR” among them. Behind the words, the following tag will be hyperlinked, http://technorati.com/tag/PR and http://technorati.com/tag/smpr and updated at Technorati. So for example, if someone searches “PR” as a tag or as a keyword, this article will hopefully appear in the list. I was surfing the Web today and checking out some of my favorite blogs. I happened upon Deirdre Breakenridge’s blog and saw that she had started reading Groundswell. I couldn’t believe it! All throughout this course (Public Relations and Social Media) we have been reading that book, and I have used it in a number of papers and blog posts. Anyways I saw that Breakenridge was also writing a book review of Groundswell and thought that many of you (my readers) would find it very interesting since Breakenridge is the author of PR 2.0 New Media, New Tools, New Audiences, which I did my Trade Book Review on. Breakenridge is an accomplished, inventive and smart woman and you should be sure to check out her other books listed here on her site. Be sure to read Breakenridge’s review of Groundswell Book Review: Part I. For the second week in a row my topic of the week will be posted by a guest blogger of my choosing. This week I chose to post something from fellow class member, Ashley London’s blog. Ashley is also a student in Barbara Nixon’s Social Media for PR class, and she has done a series of posts filed under the category of “PR Connections” about “The Big Shockers in Advertising”. I found each of these posts interesting and sometimes hard to swallow. The following post is directly from Ashley’s blog. After reading this one, I suggest you go to Ashley’s blog and read the other posts in the series. Enjoy! PETA (People for Ethical Treatment of Animals) is a company that stands for the “rights” of animals around the world. Their main focuses include animals in factory farms, laboratories, in the clothing trade and also in the entertainment industry. Recently the have started a new campaign to push people to become vegetarians. The name of the campaign is the “Save the Whales” campaign. This campaign has nothing to do with actually saving a whale. The whale in this case is referring to people, more specifically overweight people. Their underlying slogan to the campaign is “Lose the Blubber. Go vegetarian.” There has been a big stir in the media about this campaign, numerous amounts of people are taking this ad to be offensive. I think that there is a reason for people to cause an uproar about the campaign because it is really a very unethical campaign. The funny thing is the PETA’s name states that they stand for ethics and even though it is for animals, I feel it should be respected for everyone. But aren’t humans animals too in a sense? When asked about the new campaign and its controversy a spokesperson from the campaign states that they feel that animals don’t understand what is being done to them and they need someone to speak for them while on the other hand humans are able to defend themselves and can understand. They feel that this ad is not to be taking offensively but if it is then people can do something about it. My question for PETA is if you are going to offend humans on earth and then you upset them….who will be with you to save the animals? You can contact Ashley London at her blog or on Twitter. 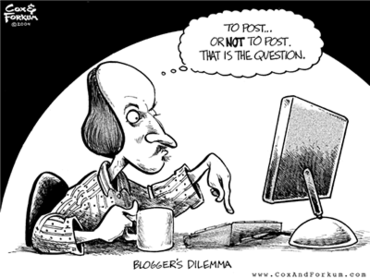 One of our last “TOWS” (topics of the week), will be posted by a guest blogger of my choosing. This assignment was handed down to our Public Relations and Social Media class by our professor, Barbara Nixon, and was inspired by Adam Vincenzini’s Be My Guest month. I have chosen my good friend and fellow public relations student, Marilyn Lintel, to be a guest blogger. The following post is directly from her blog. Personally, I think that social media has done a world of wonders; not only for those involved in public relations, but also anyone in the work force. 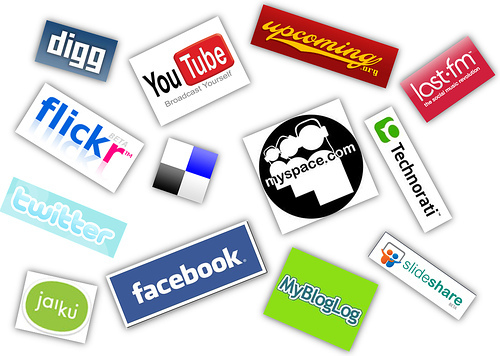 Social media involves Twitter, Facebook, blogging, Linkedin, MySpace, etc. I know I’m forgetting some but you get the idea. At my age and in college almost everyone I know is involved in some sort of social media, mainly Facebook. Nowadays parents and some grandparents are even getting hooked on Facebook, which is pretty neat. My mom uses Facebook to try and get back in touch with her high school and college friends. Social Media has basically become a revolution and its going to keep getting bigger! It’s scary to think that one day my generation will be the people asking all the questions about new technology and not having a clue what it all means. Benefits: If social media is used properly, the benefits can be amazing and really helpful. Employers can see how involved you are with social media- and today for many jobs that is a must!!! Knowing how to use Twitter, Facebook, and blogs are important to many companies because they count on the young people to keep up with the trends and be able to help the company and keep them updated in that respect. Google your own name and see what comes up. If there is only a little bit that’s totally okay, there is always room for improvement. The more involved you are the more you will have to show for it (literally). Don’t post inappropriate pictures on Facebook- this seems like common sense but employers look at Facebook to see a variety of things and if you don’t look professional then why even bother? They are not going to be impressed with the giant beer in your hand. Employers will also see your “status” on Facebook so try and keep it PG so they don’t think you are a party animal or totally irresponsible. Unlike certain networks, Twitter is a site that employers can pretty much see everything you write. Some people do protect their profile, but personally it seems like a small number, so make sure those comments are web appropriate. For the most part, employers have access to anything they want to know about you so to put it simply: IF YOU WOULDN’T WANT YOUR PARENTS TO SEE IT- DON’T PUT IT ONLINE. A new thing is going to start popping into your Twitter stream whether you’re ready for it or not! The “new thing” is Twitter’s new ad campaign called “Promoted Tweets”. These are really just advertisements disguised as “promoted tweets”. According to AdAge and The New York Times, the campaign will allow businesses to “insert themselves into the Twitter stream and rise above the noise” (Mashable). The Promoted Tweets will just start out in searches, but will soon be seen in Twitter.com streams as well as in “third party apps” like Tweet Deck and Tweetie (Mashable). Companies who are going to start using the Promoted Tweet are Starbucks, Bravo, and Virgin America (Mashable). A viral video is defined as a video that has become popular through internet sharing. Usually they are funny or silly. I think that part of the reason that small budget, homemade videos become viral is through word of mouth. The majority of the videos that I have been shown on YouTube were by friends or family or that I heard about “through the grapevine”. The reason that these videos become so popular is that once one person sees it and finds it funny or entertaining he or she will tell a few people and they will tell someone else and the word spreads like wildfire. Also, video cameras these days are relatively inexpensive. If you combine that with people who have a lot of free time on their hands you are likely to end up with some pretty funny material. YouTube was founded in February 2005 and was officially launched in November, 2005. In July, 2006 the company said that there were an estimated 65,000 new videos being uploaded daily. It’s also estimated that in 2007, YouTube consumed as much bandwidth as the entire Internet in 2000 (source)! Google acquired YouTube on November 13, 2006 and on the third year anniversary of their acquisition, Chad Hurley of Google announced that YouTube was serving “well over a billion views a day” worldwide (source). This actually makes me a little sad. It is so cringe-worthy (that’s not even a word but it should be)! It is so painful watching this girl answer the question. The question is about education in foreign countries and it should be asking about education in the state of South Carolina! What is going on in her county? Why can’t she answer a simple question? It is just awful which I think is part of the attraction. It is almost like watching a car accident; you don’t want to look but you just can’t look away. I love these dancing inmates of the Cebu Provincial Detention and Rehabilitation Center. They have done more than a few performances and this one is fantastic. This video has gotten 40.6 million views on YouTube and I think that they are fantastic; at dancing that is.